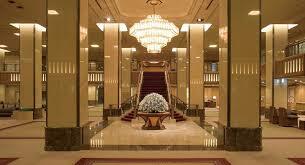 Are all Japanese five-star hotels halal-friendly? That is the question I have been asking myself and many of the representatives of the Japanese hotels in and around Tokyo. Actually, the answer to this question depends on the definition of halal-friendliness. Many of the hotels I have visited in Japan have shared the activities they have been performing to make their hotels halal-friendly for their Muslim visitors. This phenomenon is especially prevalent in and around big cities like Tokyo, Kyoto, Osaka, Sapporo and other tourist attractions such as Tokyo Disneyland, Nikko, Hakone and major airports etc. However, all of these hotels are at various phases of making their hotels halal-friendly. Some of them have been putting Qibla marks in their guest rooms, others have been buying prayer mats, scarfs for Muslim women, compasses for Qibla directions and even getting catering services from already-halal-friendly restaurants and hotels nearby. Still others have been investing in getting halal certification by implementing halal-friendly guidelines at their premises. Some of them have even started offering prayer rooms for Muslims. Some of the hotels near Tokyo’s Narita International Airport get halal food bentos from Tokyo Flight Kitchen (TFK) which caters to the needs of many Muslim and halal-friendly airlines such as Malaysia Airlines on regular basis. Japanese hotels, being customer-centric, are very keen to provide the comfort their Muslim visitors want and expect from them while staying in these hotels. To understand how to satisfying the needs of their Muslim visitors, Japanese hotels have been making efforts to have a better understanding of the cultures of the Muslim countries. They have been participating in various halal industry related events to appreciate and embrace the concept of ‘Halal’ as much as they can. However, truth of the matter is, that very few of these hotels can be fully considered Halal-friendly as they find it difficult to make completely separate halal-friendly kitchens at their premises. Being shrewd business entities, they try to find the balance between the number of Muslim visitors they are currently receiving or hope to get in the future and the cost and efforts involved in becoming fully compatible with halal guidelines. A Halal industry official from Japan Halal Association (JHA), a halal certification body in Osaka told me recently that the efforts many of the Japanese hotels have been making to make themselves as halal-friendly are amazing as not many of the hotels in Muslim countries take so much trouble to make themselves as halal compatible.